Products — ECI - Expert Consultants Inc.
ECI software tools offer developers one interface standard for all systems to help centralize development, dramatically reduce development cycles, and eliminate large capital investments. GUPI is a data transformation tool that acts as the translator between humans and computers. It allows users to transform and display almost any type of data using a functional hierarchy of parsing rules. GUPI is ideal for protocol analysis where some or all of the protocol is unknown. 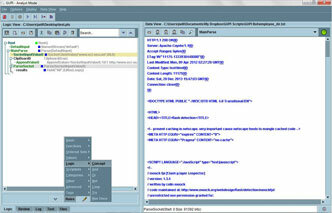 Epiphany provides a flexible, scalable framework for link analysis. Users view data as link diagrams to visualize relationships and hierarchies between objects. Diagrams can also be shared to maximize collaboration within an organization. FlexST is a software development and management tool that enables users to view, build, and modify logic components to quickly develop applications for multiple environments. Gridflo allows users to monitor, maintain, and manipulate distributed computing networks to achieve more efficient data processing power. It's interface provides a realtime view of loads based on enterprise, sites, systems, machine, and applications.